Razor Pocket Knife - 3Cr13 Stainless Steel Blade, Tinite-Coated Stainless Steel Handle With Open Finger Ring Design - Length 10 1/2” | BUDK.com - Knives & Swords At The Lowest Prices! Fine lines, a slim profile and perfect curves make our Razor Pocket Knife as sleek and sophisticated as an Italian sports car. The Lamborghini of folding razor knives, it has a 4” 3Cr13 stainless steel razor blade with a tinite-coated finish, a sharp 3” edge and an extended tang. The 6 1/2” tinite-coated, stainless steel handle has a super slim profile and features an open finger ring design. 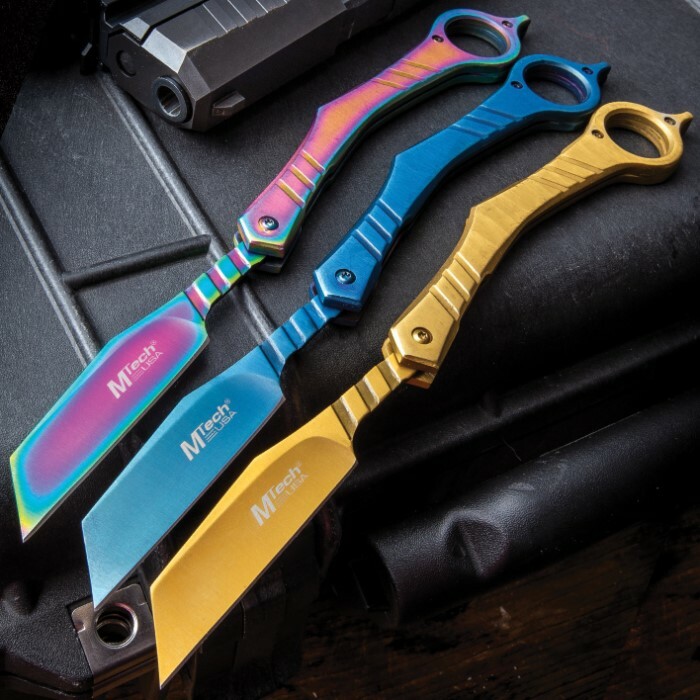 This 10 1/2” overall, folding razor knife is available in the colors blue, gold and rainbow.